the Harmony Framework Configuration > System Services > Console > Use Console System Service? selection tree. Change the "Select Peripheral for Console Instance" to USB_CDC_CONSOLE. This selection will trigger the MHC to enable the USB Library for you. the Harmony Framework Configuration > USB Library > Use USB Stack? > USB_Device Instance 0 > Product ID Selection selection tree. 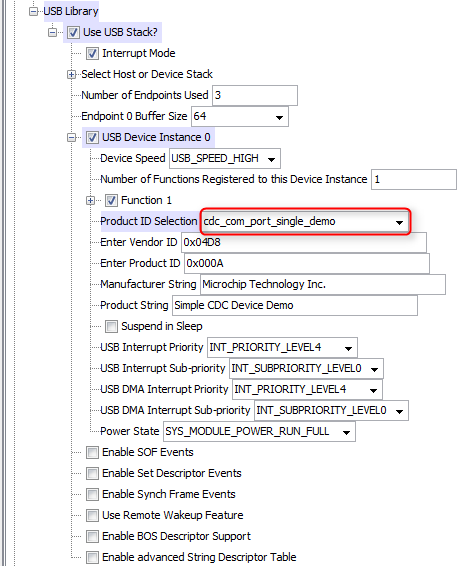 Change the "Product ID Selection" to cdc_com_port_single_demo.